PR: Apple on Tuesday unveiled its new MacBook Pro notebook computer featuring the new Intel Core Duo processor which delivers up to four times the performance of the PowerBook G4. The new MacBook Pro, the first Mac notebook based on an Intel processor, features a stunning aluminum enclosure just one inch thin, weighs only 5.6 pounds, includes a built-in iSight video camera for video conferencing on-the-go, and the Apple Remote and Front Row software for a simple, intuitive and powerful way for users to enjoy their content wherever they go. The new MacBook Pro, available in February, also features Apple's new patent-pending MagSafe magnetic power connector, designed especially for mobile users. "MacBook Pro delivers dual-processor desktop performance in a thin, sleek notebook," said Steve Jobs, Apple's CEO. "The new MacBook Pro, with its Intel Core Duo dual-core processor, delivers the performance of not just one, but two G5 processors in the world's most stunning one inch thin design." MacBook Pro features the new Intel Core Duo processor which delivers dual-core performance in a breakthrough power-efficient design, making it ideal for use in MacBook Pro's thin and lightweight design. MacBook Pro is up to four times faster than the product it replaces, the PowerBook G4, running industry standard benchmarks. Every new MacBook Pro comes with a built-in iSight video camera for video conferencing on-the-go using Apple's award-winning iChat AV, or recording a video Podcast or iMovie using iLife '06. MacBook Pro also includes Photo Booth, Apple's fun-to-use application that lets users take quick snapshots with the built-in iSight video camera, add entertaining visual effects and share their pictures with the touch of a button. The new MacBook Pro is the first notebook to feature Apple's breakthrough Front Row media experience and the Apple Remote, turning MacBook Pro into a portable theatre. Front Row gives customers a simple way to enjoy their content wherever they go - including songs from their iTunes music library, photo slideshows from iPhoto, videos including TV shows, Podcasts, iMovies and DVDs, and popular movie trailers streamed from apple.com - all from up to 30 feet away. The new MacBook Pro also debuts Apple's patent-pending MagSafe magnetic power connector, designed especially for mobile users. The MagSafe power connector makes charging the notebook's battery easier than ever by magnetically coupling the power cord to the MacBook Pro. The MagSafe power connector safely disconnects from the notebook when there is strain on the power cord, helping to prevent the notebook from falling off its work surface when the power cord is inadvertently yanked. The new MacBook Pro features a 67% brighter 15" display, which is now as bright as Apple's Cinema Displays, and offers a completely new system architecture for faster performance, including a 667 MHz front-side bus that is four times as fast as the PowerBook G4 and 667 MHz DDR2 SDRAM memory expandable to 2 GB that is twice as fast as the PowerBook G4. Each MacBook Pro comes standard with ATI Mobility Radeon X1600 PCI Express graphics, with either 128 MB or 256 MB of dedicated GDDR3 graphics memory. Each MacBook Pro includes built-in Bluetooth 2.0+EDR (Enhanced Data Rate), integrated AirPort Extreme 54 Mbps 802.11g WiFi wireless networking, a scrolling trackpad and Apple's Sudden Motion Sensor that is designed to protect the hard drive in case of a fall. The new MacBook Pro includes iLife '06, the next generation of Apple's award-winning suite of digital lifestyle applications featuring major new versions of iPhoto , iMovie HD, iDVD , GarageBand and introducing iWeb , a new iLife application that makes it super-easy to create amazing websites with photos, blogs and Podcasts and publish them on .mac for viewing by anyone on the Internet with just a single click. All the iLife '06 applications are Universal applications that run natively on the new Intel-based MacBook Pros for maximum performance. Every new MacBook Pro comes with the latest release of the world's most advanced operating system, Mac OS X version 10.4.4 "Tiger" including Safari , Mail, iCal , iChat AV, Front Row and Photo Booth, running natively on Apple's first Intel-based notebook. Mac OS X Tiger includes an innovative software translation technology called Rosetta that lets customers run most Mac OS X PowerPC applications seamlessly. The new 15" MacBook Pro will be available in February through the Apple Store, Apple's retail stores, and Apple Authorized Resellers. Visitors to the Apple Store can pre-order MacBook Pro beginning immediately. 85W AC power adapter with MagSafe magnetic power connector. Additional build-to-order options for the 15" MacBook Pro include the ability to upgrade to 120 GB (5400 rpm) or 100 GB (7200 rpm) hard drive, up to 2 GB DDR2 SDRAM, Apple USB Modem, and the AppleCare Protection Plan. PR: BookEndz, a division of OlympicControls Corp. is pleased to announce the long awaited 17" Docking Station to the existing product line that dock with the new PowerBook G4 Apple laptop computers. BookEndz Docking Stations eliminate cable confusion and damage to connectors. Once the peripheral devices are plugged into the BookEndz Dock, they can remain in and the PowerBook can be connected or disconnected as needed. No hassle, no crawling around looking for cables. The New 17" BookEndz Docking Station replicates all of the connectors on the PowerBook and plugs in quickly and easily. It has an easy to use ejection system that ejects the PowerBook with one simple movement. The product line includes docking stations for all of the Power Books and iBooks dating back to 2000. BookEndz is protected by US Patent # 5,186,646 and produced by OlympicControls Corp. in Elgin, Illinois USA. PR: Six days prior to the 2006 Macworld Conference and Expo in San Francisco, Other World Computing (OWC) gave an advanced preview of the highest capacity, fastest speed portable storage solution on the market, offering the newly engineered Mercury On-The-Go Pro Series 800/400+USB 2.0 in an under 12-ounce design with an unparalleled 160 Gigabyte storage capacity and running speed of 5,400 revolutions per minute (RPM). OWC was scheduled to introduce the unmatched 2.5", 160 GB drive in early second quarter 2006 but instead shocked the technology industry by previewing the design prior to the Consumer Electronics Show in Las Vegas January 5, 2006, with the unit's official premier and immediate availability to the public at the Macworld Conference and Expo beginning January 10, 2006. "Other World Computing is dedicated to always striving to exceed consumer expectations by providing innovative solutions for today's technology users that are faster, more powerful, more reliable and more affordably priced than those available anywhere else," stated CEO Larry O'Connor. The Mercury On-The-Go features both FireWire 800/400 and USB 2.0 ports, making it compatible with any Apple or PC with an available FireWire or USB port. The new 2006 On-The-Go Pro series adds FireWire 800 capability to double the potential performance power of the previous incarnation of the On-The-Go line, already recognized by technology authorities including Mac Addict, Macworld and Maximum PC for industry-leading value and performance. All Mercury On-The-Go drives come with two FireWire 800/400 and one USB 2.0/1.1 ports and ships with carrying case, FireWire 400 cable, FireWire 800 cable, USB cable, EMC/Dantz Retrospect and Intech Speed Tools. They also are covered by a one-year warranty and officially supported by Dantz Retrospect with the EMC/Dantz Retrospect Backup Certification. On-The-Go plug-and-play drives are compatible with all Apple OS Versions 8.5 through 9.2.x; Apple OS X 10.0.3 and higher (including OS X 'Tiger' 10.4.x); Microsoft Windows 98SE, ME, 2000, XP; and any OS or electronic device with FireWire and/or USB data ports, including digital video and still cameras. The On-The-Go line features drives with 40- to 160 GB of storage space running 4200-, 5400- or 7200 rpm starting at $129.99. FirmTek, LLC, a leading developer of Serial ATA storage solutions, announced today at Macworld Expo the latest addition to their line of Serial ATA adapters for Macintosh and Windows computers. The SeriTek/1SM2 PC Card is a Type II 32-bit CardBus host adapter which brings superior Serial ATA 1.5 Gbps storage transfer performance to notebook computers. The SeriTek/1SM2 shares many advanced features with FirmTek's popular line of SeriTek host adapters such as best-in-class performance, the ability to hot-swap hard drives without having to power down the notebook (even drives which are configured as part of a RAID array), ease-of-use comparable to USB and FireWire, and the incorporation of FirmTek's expertise in providing quality products with extreme compatibility and reliability. "Users who take their work on the road need an option to quickly and reliably swap and share high-performance Serial ATA hard drives among desktop and notebook computers," said Chi Kim Stanford, VP of Business Development. "Now they have that option with our new SeriTek/1SM2 notebook PC Card adapter, enabling desktop-style storage performance and capacity on laptop computers." FirmTek's SeriTek/1SM2 PC Card Notebook adapter will be available during the first quarter of this year for the estimated retail price of $89.95 (P/N SATA-1SM2 - http://www.firmtek.com/seritek/seritek-1sm2). Specially priced bundles with enclosures will also be available. For more information or to purchase FirmTek products, please email sales@firmtek.com or visit FirmTek's website. PR: TOM BIHN, designer, manufacturer and retailer of laptop bags has created the new Size 4X of their hard-shell Brain Cell and Monolith laptop cases specifically for the 15.4" MacBook Pro. The MacBook Pro, introduced by Steve Jobs during his keynote at the Macworld conference, requires an entirely new size of protective case designed specifically around its dimensions, which include a very thin 1" height. You can pre-order the Size 4X Brain Cell (Shipping February 15th) and Size 4X Monolith (Shipping February 28th) today. The Brain Cell (available in eight sizes, including Size 4X) and Monolith (available in five sizes, including Size 4X) laptop cases take laptop protection a step further. Cradled in 8mm thick soft foam padding, the laptop hangs suspended in a 4mm hard corrugated plastic insert that protects from the front, back, and bottom. The sides are protected by dense crosslinked closed-cell polyethylene foam. This offers the toughest protection you can get for your laptop in a case that is still light and minimalist. The Brain Cell will clip securely inside one of our messenger bags or briefcases, be carried on its own, or slip into your current bag. The Monolith is designed to clip inside our backpacks, slip inside your current backpack, or it can also can be carried on its own. The Brain Cell and Monolith are available in five colors: Black, Steel, Deep Blue, Crimson, and Wasabi. The Size 4X Brain Cell is in production now and available for pre-order today with a ship date of February 15th, 2006. The Size 4X Monolith is available for pre-order today with a ship date of February 28th. The Size 4X Brain Cell retails for $50. The Size 4X Monolith retails for $45. PR: Targus Inc., maker of the world's best-selling notebook cases and accessories, introduces the Beemer line of ladies notebook cases, featuring a unique, two-tone nylon fabrication and soft pink suede-like lining in four fashionable silhouettes - Messenger, Topload, Backpack and Slipcase. "The basic black case in any category is always our number-one seller, but female consumers are now looking for style and color as well," said Michael Greco, director, US product marketing for Targus. "The Beemer line of notebook carrying cases provides the ideal combination of a conservative exterior with a fun and fashionable lining. Feature-packed, the Beemer line offers the durability and protection Targus cases are known for, but also incorporates style and functionality that women will appreciate." Designed to protect notebook computers with screen sizes up to 15"es, the Messenger front pocket workstation that offers a notebook compartment with petal pink faux suede lining, removable business card holder, compartments for files, a cell phone and PDA, as well as pens and pencils, a key fob, and back slip pocket for additional file folders. The Messenger's padded shoulder strap provides extra comfort and is removable for an additional carrying option. Measuring 15" x 3" x 13.25" and weighing 1.9 lbs., the suggested retail price is $49.99. Offering quick and easy access to the notebook compartment for airport security removal, the Topload is designed for notebook computers with screen sizes up to 15"es and includes a security strap to protect the notebook during travel. The Topload featuring a mini front pocket for small items, an interior slip pocket for files, as well as a front pocket workstation with pockets for a cell phone and PDA, pen and pencil holders, a business card holder and a key fob. The Topload's shoulder strap is padded for a comfortable fit, or can be removed and carried by hand. Measuring 15.75" x 4" x 13.75" and weighing 2.65 lbs., the suggested retail price is $59.99. Loaded with features, the stylish Backpack includes a front flap with a business card holder, key clip, pen loops, a pocket for airline tickets, a detachable mobile phone case and strap, as well as a padded inside compartment that fits notebooks with screen sizes up to 15.4"es with a bonus file folder section, and a back zip pocket for additional files and travel accessories. The convenient "hideaway" backpack straps and removable shoulder strap offer a variety of carry options. Measuring 13" x 4" x 15.75" and weighing 2.93 lbs., the suggested retail price is $69.99. Designed for notebook computers with screen sizes up to 15"es, the Slipcase offers an interior slip pocket and security strap to hold the notebook in place during travel, as well as oversized front pockets for additional accessories and mobile devices such as a cell phone and PDA, as well as a business card holder and pen loops. 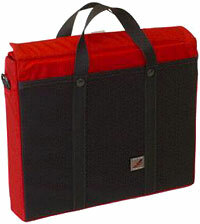 The padded shoulder strap provides comfortable travel, and can be removed for an additional carrying option. Measuring 15.37" x 2.5" x 13" and weighing 2.54 lbs., the suggested retail price is $39.99. All Beemer cases offer a limited lifetime warranty, and will be available in March at select retailers as well as online. "Asus has signed a deal with Italian automobile maker Lamborghini to produce a line of notebooks that sport the car company's logo. "The Lamborghini laptop lineup will include glossy black and yellow machines which, Asus claims, 'with the look alone, exude power, speed, strength and beauty'. Apparently. "Actually, they look quite swish, with some sharp-looking angular features that give them a certain futurist quality, which broadly matches the car company's own design philosophy." "...Intel is about to join forces with Italian sports car giant Automobili Lamborghini to produce Lambo-branded laptops. "The laptops are said to be based on the next generation Centrino platform, codenamed Napa, and will feature the forthcoming Yonah CPU that uses two processing cores instead of the usual one. So it should be fast enough to live up to Lamborghini's reputation. Sort of. "As a Windows-based laptop, the Lambo will inevitably be crashing a lot, but the good news is that (unlike a real Lamborghini) its chassis won't be reduced to a mangled heap of metal, and there's no insurance premium to pay - just hours of your valuable time." PR: ASUSTeK Computer Inc. (ASUS) and Automobili Lamborghini have announced a comprehensive partnership that merges advanced information technology and automobile heritage. The result is the stunning Lamborghini Notebook Series that inherits all the striking traits of a true Lamborghini. Available in both yellow and black, the Lamborghini Notebook Series is the ultimate representation of technology and automobile fusion and a true mobile computing revolution. With design details and special mirror painting finish, the Industrial Design team at ASUS has successfully produced an exceptional innovation that, with the look alone, exudes power, speed, strength and beauty. "The ASUS and Lamborghini alliance brings together two brands that represents the highest quality and performance," said Tony Chen, Director of ASUS Notebook Business. "The new ASUS Lamborghini Notebook Series, a fusion of the best from both companies, will surely provide a different mobile computing experience. With unique mobile technology from ASUS and Lamborghini's cutting-edge industrial designs, the all-new notebooks provide a breath of fresh air to the boring looks of existing portable PCs." With the release this week of the Intel based MacBook Pro, prices of used/refurbished PowerBooks have begun to plummet.